I promised myself I would always be authentic in my blogging journey, so my friends, I’m putting out there my rookie DIY projects for all to see. My background is not in being a domestic, crafty, SAHM as so many bloggers are. I was a high school English teacher for 15 years before I had my boys just over 2 years ago, so I’ve always been into writing and literature – the more brainy, academic stuff. Since being home, I’ve really wanted to tap into the creative, right side of the brain (not to mention, I totally feel like I’ve lost all my academic smarts since I’ve stopped teaching). 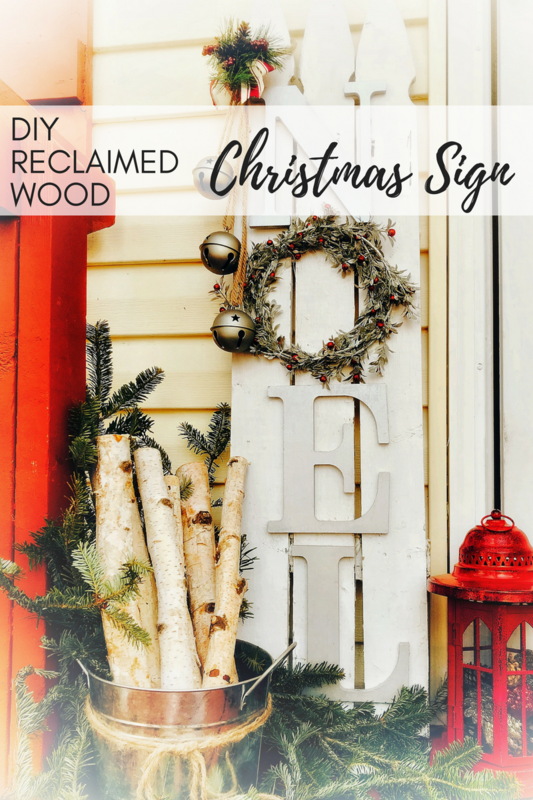 I’ve tried a few crafty projects to date (you can check out the Nativity Trail Mix Mason Jar and the Christmas Wall Art Printable to see my first two amateur projects), but this is my first time with a wood, farmhouse-type project. At this stage of my crafty career, I’m not really the ‘Pinterest Perfectionist’ kind of crafter; I’m more like the ‘Lazy Girl’s Shortcut” kind. However, my dad and my sisters are pretty amazing at this creative stuff, and I’m convinced that it’s in my DNA somewhere, and I’m determined to find it. So here’s my first ‘big’ project. I got the inspiration when a pretty wicked windstorm blew through Long Island and knocked down a portion of our picket fence (that, to be honest, was hanging on by a rusty nail). Some of those pickets were salvageable, and I thought it would really cool as a Christmas sign. I had seen this Joy sign and this Noel sign previously, and it stuck out in my mind as something I might want to try. Hence, I put my own spin on them, and the sign you see below was born. I wasn’t really sure if it was ‘Pinterest-worthy’ – but I was proud of my first attempt and it was good enough for our porch. And, I thought it might inspire some of you who feel like maybe you aren’t too crafty. We all have to start somewhere, and this project was pretty easy, all things considered, even for someone like me who is neither handy nor crafty. It is easily customizable – you can choose whatever word you want to go down the front, choose your colors, choose your materials. Very easy to make all your own! 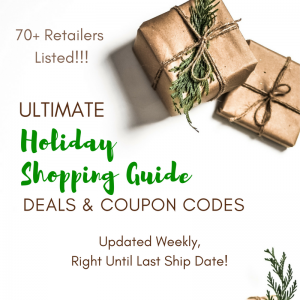 Wreath or Garland – I bought garland from Michael’s. Select your pieces of wood and attach them together to create one board. 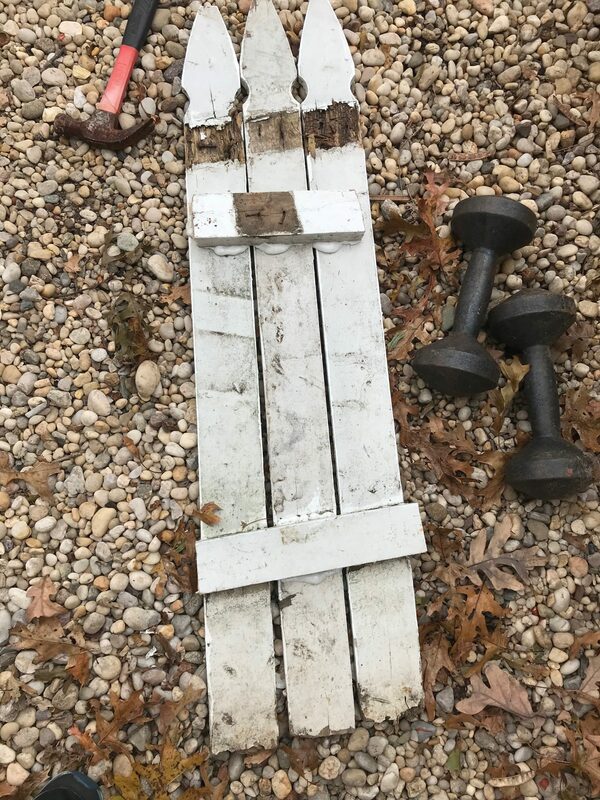 For the picket fence, there were 2 pieces still attached to the bottom crossbeam that were in good shape. I found a 3rd picket and placed it in between the 2 to create the board. If you don’t have a crossbeam still attached, take a scrap piece of wood and cut 2 braces – 1 for the top and 1 for the bottom. Just be sure that braces are smaller than the width of your boards combined. If you are using nails or screws, arrange your boards face up, with your braces underneath. Then, nail/screw your boards to the braces. If you are using Gorilla Glue to attach wood to the braces, arrange your boards face down and glue your braces to the back. Gorilla Glue worked fine for me. The optimal time for Gorilla Glue to set is 24 hours, so give yourself some time. Once my boards were glued, I laid these dumbbells on top for pressure to hold it together. I probably should have cleaned and prepped the wood better (Lazy-girl, remember? ), but it held together just fine. Meanwhile, paint your letters if you need to. This silver paint was suitable for indoor/outdoor use, so it was perfect for an outdoor sign. Once your board is set, paint or touch up as desired. I wanted something of a rustic looks, so I only did minor touch-ups to the wood. If you are using a wreath for the ‘O,’ the spacing is self-explanatory. I didn’t find a wreath I liked, so I used a pretty garland I found at Michael’s instead. I had to make sure it would be the same size as the letters, so I wrapped it to the size I needed and tied it in the shape of a wreath with thread. 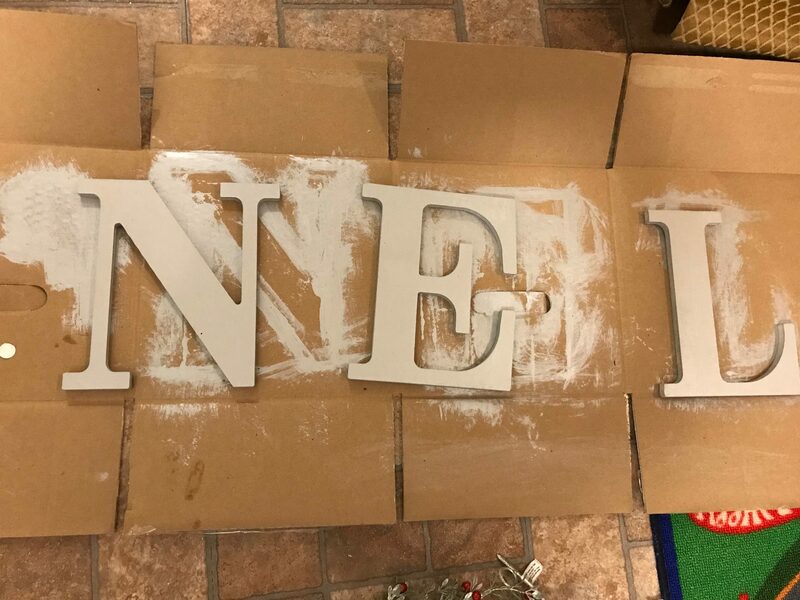 Once your letters are arranged, use Gorilla Glue to glue down the wreath and the letters. Then, to hold it down, place a piece of cardboard over the top and put some weight on top. I used the same cardboard that I painted the letters on, and I put the dumbbells on top. After 24 hours, your sign is ready! 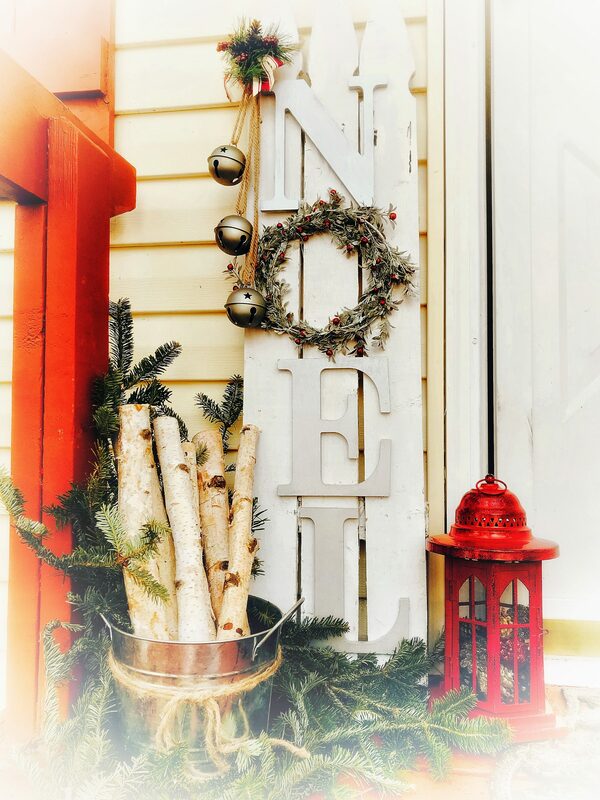 Embellish it with bells, jute string and pine cones – or any decorative element of your choice. I used these bells that I found at Michael’s. I know this project isn’t the Queen in the Pinterest Empire, but I’m pretty proud of it, for my first go around. From what I’m told, the more you do projects, the better you get. And we all have to start somewhere! Thanks for joining me on my rookie run on this DIY reclaimed wood project! I would love to see and hear about some of your ‘firsts’! Please share them in the comments below or on social media! What a cool sign! I like how you styled the sign too. Very festive!! How cute it that?! Love it. Thank you! :) I keep trying! :) Thank you for coming by, Kristi! I love this it is so beautiful!! Thank you so much! I'm a work in progress, lol!